Please tell me about your hometown. I am from Pyin Oo Lwin in the Mandalay Region, which is located in central Myanmar. The weather is pleasant, being not too hot or cold, so it is famous as a place for a summer retreat. The National Kandawgyi Garden is a famous tourist spot here. Every year in December, there is a Flower Festival where we can see many different kinds of colorful flowers. It is really beautiful. Pyin Oo Lwin is also famous for waterfalls. For example, the Pwe Gauk Waterfall, while not being a big waterfall, is really beautiful. It is also fun to shop around the souvenir shops that are around the waterfall. I would recommend this place to all Japanese tourists. I heard that Myanmar and Japanese cuisines have a lot in common. Exactly. For example, rice. The rice we have in Myanmar is Indica Rice and it looks and tastes different from the Japanese rice. In Shan State on the east of Myanmar, however, some farmers plant the “sticky rice” which is actually sticky like the Japanese rice. The texture of this rice is quite similar to Japanese rice, so when people in Myanmar want to make sushi, they will use this rice. And in Myanmar, we have natto too. In Myanmar, we call it Pe pok, but it is not stringy. We mix it with meat and vegetables such as tomatoes and onions, and eat as a salad. Sometimes, we make it into rounds and dry it (Pe pok chauk) and use it in our cooking. I hope to try it one day when I go to Myanmar. By the way, can you tell me about the student life in schools and universities in Myanmar? The education system in Myanmar is different from Japan in many ways. The biggest difference is the entrance exam. In Myanmar, there is no entrance exam for university. Our future pathway depends on the results of our final exam in high school. In order to enter an academically advanced university, we must obtain a high score in the exam. When I say “There is no entrance exam”, some people may think that there is no pressure at all. Well, in fact it is totally the opposite. I was really worried that I will experience hardship in the future if I do not work hard in high school, and therefore not being able to enter the university I want. The pressure was really huge. Honestly, I felt tired of working hard before. Besides, there are cases of people who entered the universities of their choice after obtaining good scores in high school but couldn’t keep up with the hard work in the university and dropped out. Life is not easy after entering the university, it seems. Did you actually see a student dozing off in class? No, not at all! There is certainly no such student in Hiroshima University (laughter). But I find that in Japan, students’ attitude in class is more relaxed and they can do things like checking their phones in class. We don’t see such things in Myanmar, impossible! Occasionally, teachers go around patrolling in the campus. They warn students who are still playing outside to go back to their classes. Also, hair-coloring is prohibited and students must wear their uniforms twice a week. Students must follow the rules in order not to ruin the reputation of the university. It is rather different from the universities in Japan, right? By the way, what made you interested in Japan? Although I scored good results when I was in high school, I couldn’t decide which university to enter after that. At that time, I happened to have a female friend who was studying Japanese. Not only that, Myanmar was starting to open up to the world and many overseas enterprises, including Japanese, began to expand their businesses to Myanmar. In such circumstances, it is said that people who can speak the Japanese language will have better chances for employment, so I decided to enroll in the Japanese Language Department. At that time, I started studying the Japanese language in order to “get an office worker job”. 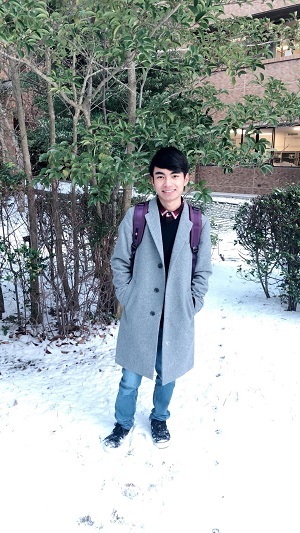 But then a significant change in my life happened, and that was in 2015, when I first came to Japan. Did you come here to study? 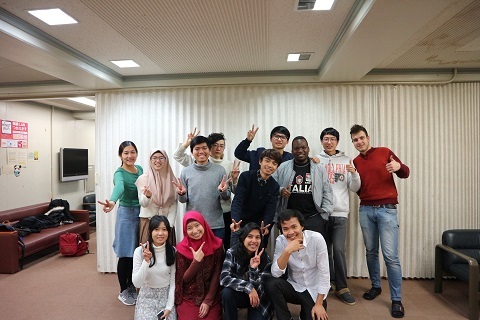 No, I came to Japan under the JENESYS Programme (Japan-East Asia Network of Exchange for Students and Youths). I stayed one week in Tokyo and one week in Kochi prefecture. During my homestay in Kochi prefecture, my host father taught me the Japanese idiom “Ichi-Go-Ichi-E” (meaning “once-in-a-lifetime opportunity”) and he told me this - “Cherish each encounter” and “Work to form a bridge between Myanmar and Japan”. I couldn’t agree with him more after hearing his words. And I thought to myself, thanks to my Japanese language studies, I have had the opportunity to interact with Japanese people. It will be a waste if I end up just “getting a job”. That’s when I began to think about my future differently. Now, I think I want to work in the United Nations, or even if I were to “get a job”, I want to work with a company that has connections with Japan. I see that you had a precious encounter in Kochi prefecture. By the way, when did you get to know about Hiroshima University? I got to know about Hiroshima University from the senior who came here to study in 2016, under the same program I am in now. My decision to come here was not only based on my senior’s recommendation, but also from my research of university ranking and other information I checked out about Hiroshima University. You are in the Japanese Language and Culture Studies Program, right? How do you think of the lessons? The lessons are very interesting. The textbooks are also very useful. Above all, I think Hiroshima University gives us a lot of freedom compared to other universities. According to my friends who are studying in universities in Osaka and Hokkaido under the same program, they are always busy struggling to meet task deadlines. But the situation for me is totally different. I hand in my assignments only once a month and I am only required to take 5 lessons per week. So, here in Hiroshima University, I get to spend the kind of campus life that is meant to be more meaningful. How about your interaction with Japanese students? I have plenty of Japanese friends now! Actually I can speak five languages, and at first I thought that Japanese students can speak many languages too. So I was surprised when they said, “wow! Amazing!”, when I told them about it. And they praise me when I speak English and have seriously asked if English is the official language in Myanmar. Actually, pronouncing English words is not difficult for Burmese. In Burmese, our official language, we have many syllables and this makes learning English pronunciation easy. So for Japanese people who have a hard time learning English, they may have the impression that Burmese can speak English well. I heard that you are interested in translating and interpreting. Yes. There are many interesting books in Japanese which I think young Burmese will like to read. Japanese gain knowledge and widen their perspectives from those books, and I think it is a good way to learn. Nowadays, there is a serious problem in Myanmar- youngsters don’t like to read books; instead they are always on their phone checking Instagram, Twitter, etc. Maybe if they read foreign books translated by a youngster like me, they may find them interesting and continue to read more books. I am hoping that this will happen one day. Which book (that you want to translate) do you have in mind? “Yume Juya (Ten Nights of Dreams)” by Soseki Natsume. I think is a mysterious story, but interesting too at the same time. When I was reading this book, my imagination wandered from trying to understand what the author was thinking when he wrote it, to what is the message that he is trying to convey. My special interest was the part where the samurai was desperately trying to reach satori, or enlightenment. Reaching “enlightenment” is not an easy task, but he was so bullish just because he is a samurai. I felt like this was funny. By the way, how do you spend your free time? I love anime, and I watch a lot of that. And when I encounter any Japanese words that I do not understand, I jot it down in my notebook. So now the book is full of new words. Last year I went to the Sake Matsuri Festival with my friends and Japanese student supporter. I can’t drink alcohol, but it was fun even for people who do not drink. There were many kinds of food and it was lively with people and families. I was impressed with the people there, no matter how drunk they were, they didn’t litter and kept the place clean. But if it was in Myanmar, there would be litter everywhere, as whenever we have festivals (laughter). Aung-san, do you have any advice to youngsters in Myanmar who wants to study abroad in Japan? Well, I would advise them to learn about its unique culture and customs well before coming to Japan. 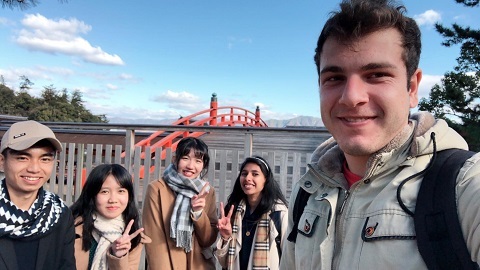 Actually, I had the opportunity to talk to students who studied in Japan before, and among them, some knew about Japan only after they came here. They didn’t have prior knowledge about the “cultural differences” (These English words were beautifully pronounced!) between them and the Japanese, and some of them even return to their countries with the wrong impression that Japanese people are unfriendly and unkind. Exactly! They came here with high expectations, but it is a shame if they were to go back with a bad impression of Japan. To avoid this misunderstanding, it is important for foreigners to try to understand Japan. Not only that, I think Japanese people should think again about their attitudes towards foreigners. For example, try to smile when talking to them, or try to be more broad-minded with them, etc. This way, not only international students but all visitors to Japan will go back with a pleasant impression of Japanese people. I understand Japanese culture well, and I know it takes time for us as a foreigner to get acquainted with Japanese people. So, I take no heed to Japanese people who don’t show a friendly attitude when we meet for the first time. On the contrary, I will think that he/she is typical Japanese. But of course I have had some bad experience with Japanese people as well. Some time ago, I was late for an appointment. Despite having apologized for the incident, my words were not heard and I was ignored after that. I felt really down then. Before that, I always told my friends that “Japanese people are very friendly”. But ever since then, I add the word “Most” before that sentence. So, you think being broad-minded is important. I think so. I think one should listen to what others have to say, especially when they are angry. Whether they decide to forgive or not, that is another story. By listening to others, the person will feel relieved knowing that they get a fair chance to explain. I think Japanese need to improve in this matter. If not, I may have to change “Most” to “Some” one day (laughter). Thank you for your valuable tips. Now, the last question: Please tell me your dream, Aung-san. I have three dreams. First, is to travel around the world. Second, I hope to be the ambassador to the United Nations one day. And lastly, I would like to work in the fashion industry. Your dreams are really big. Yes, especially for youngsters like me, to work in a huge organization like UN, is a distant dream. But I hope to work hard to achieve it. I really admire people working there. In fact, among the three dreams, the one I want to fulfil most is travelling around the world. In order to do that, I will work hard and earn as much as I can when I get a job. After 50 years, maybe, I will travel the world with the money I earned. That is my plan. Working in UN, fashion business and travel worldwide; I hope all your dreams will come true.